Devil-may-care is the term of the day at The Library, as the Librarians face off against the Devil himself in And the Infernal Contract. We get a healthy load of comedy, action, and a surprising amount of character development. Eve Baird (Rebecca Romijn) has left the Library temporarily to help her friend (or as Jones keeps saying, her "friend", complete with air-quotes), Sam Denning (Michael Trucco), who is running for Mayor in his hometown of Hawthorne, New Hampshire. As it turns out, the Librarians are sent to Hawthorne by the Clippings Book over the disappearance of Denning's campaign aide Brandy Vargas (Kanani Rose). Denning and Baird, who did have a relationship when both were serving in the military, have a rule with each other: no lying, but both appear to be breaking it. Baird suspects Denning knows more than he says, and when Vargas comes crashing through a portal, dead, Baird is forced to reveal the truth about The Library and her 'security firm'. It isn't long until Jenkins (John Larroquette) confirms what the Librarians have pieced together: Denning's opponent Keating (Matt Nolan) is the beneficiary of a contract with A devil not THE Devil. The Keating family signed this infernal deal centuries ago, the terms being that every 44 years a disaster would befall Hawthorne and that the Keatings would benefit somehow (usually in playing the hero). The contract's next 44th anniversary is this year, and the Librarians have to stop the disaster from occurring. This means Jenkins and Cassandra (Lindy Booth) have to go undercover at a soiree as a good-time girl and her sugar daddy, with poor Jacob Stone (Christian Kane) as their chauffeur (much to his irritation at the subservient role). Ezekiel Jones (John Kim) is there to help find the contract through his breaking-and-entering skills. 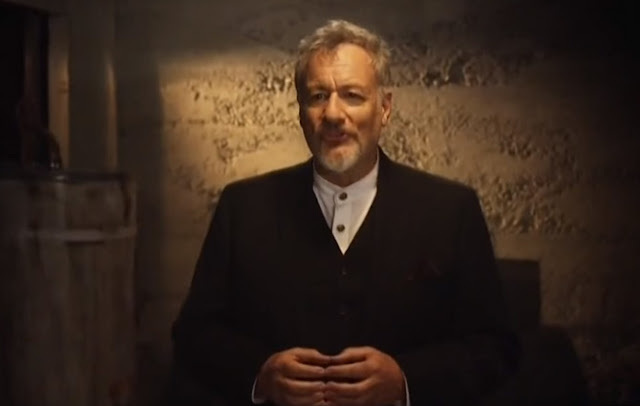 Now comes the devil in the form of Sesselman (John De Lancie), who is an old hand at this game. It would thrill him to get his hands on the virtuous Jenkins/Galahad, but he's both immortal and incorruptible. The Librarians, however, are not, and the Devil tempts them, especially since he's already got Denning to sign the Keating contract, making theirs null and void. Eve is shocked and angered at both Sesselman (whom she calls "Ses") and Denning for this, but her priority is to save the Librarians themselves, who do work together to stop the oncoming disaster (a pipeline explosion that would kill dozens of people at a campaign event, with Denning there to be the hero he wants to be). They do stop the pipeline explosion, but Sesselman has a few tricks up his sleeve. He causes the gas to start affecting them, trapping them as they slowly succumb to the fumes. Sessleman is able to tempt them to sign a contract with him and not just save their lives, but also be whomever they want to be. Jones can be "a swashbuckler in a world of accountants", Cassandra can usher in a 'golden age of math-magic'. None of them, despite the lure, are willing to sell out to Satan. In the end it's Baird who saves the day. She tricks Ses by signing the contract herself (knocking out Denning in the process, payback for him punching her to get the contract in the first place) and by making her wish...to make Sesselman human. Now he is cursed to live out his life as a human (much to his disappointment). With that, the curse is lifted and all goes back to relative normality. And the Infernal Contract is quite breezy and fun given that we've got devils and dead girls flying about. This is primarily due to the cast, both regular and guest. Given that Jonathan Frakes (Commander Riker from Star Trek: The Next Generation) directed the episode, it was a stroke of genius to have Q himself as the Devil. De Lancie is droll and utterly calm as the manipulative Sesselman, never overplaying the villainy or camping it up. Instead, De Lancie finds the right balance between humor and horror (his thoroughly shocked reaction when he realizes Eve's wish is for him to become human is hilarious and natural to his character). One could see how anyone could be tempted to join the dark side. Trucco was pretty good as Denning. You could see he still harbored some feelings for his old military buddy, and that he was motivated by good but went about things the wrong way. Since he spent almost all his time with Baird it's hard to judge whether he would have done more with the character, but he and Romijn worked well together. The regular cast is equally good at handling the comedy. Of particular note is the great double-act of Larroquette and Booth as Jenkins and Cassandra. It's so amusing to see Jenkins, thoroughly stuffy and not given to working in the field, out of his element as the faux-billionaire, and Booth's 'bimbo voice' to her "Sugar Rose" gives her a new level of comedy that we haven't seen much of with our sweet-natured Cassandra. She gets a lot of highlights, such as when Eve and Denning storm the hotel room where the Librarians have made the connection between the goings-on and the Devil. Giving a cheery wave, Cassandra says, "So glad you're not the Devil" and make it sound thoroughly real. Kane continues to make Stone a loveable albeit at times irascible person. He is highly unhappy about being the driver, and remarks to the suggestion that he isn't 'posh' enough to be at the party, "You know what the upper crust is? Crumbs held together by dough", as clever a line as has been said. We see that Kim too gets a moment where his Jones is evolving as a person. Jones uses a magic dreidel to help find a way to break in, and Stone is amazed that despite this magical technology Jones doesn't use it to break into other places. "You're becoming a good guy," Stone offers in praise. The idea that Jones is 'good' doesn't please Jones, who promptly returns Stone's wallet that he just swiped. The comedy comes fast and furious. Denning's dismissal of Eve's 'security firm' as consisting of "a kid, a cute chick, and a guy who looks like a bar fighter" is actually a pretty apt description of the Librarians' personas (and a sign that yes, one shouldn't judge a book by its cover). When asked how the Devil would look like, Jenkins replies devils come as everything you wish for. "Like Katy Perry, wearing the Crown Jewels, with a wad of cash, and a fondness for young Aussie boys", he says to Jones, clearly aware of what excites him. The drollness of Larroquette makes this all the more amusing, as is his reaction when his sugar baby smacks his behind. About the only thing I would say doesn't quite hold up is the Keating element. Given how little we see of Keating himself, I think that was just a plot device to get the urgency of the 44-year tragedy rolling. I can remember Nolan appearing only twice in the whole episode, and one wonders what happened to him after the contract was rewritten. I am not going to get hung up on that detail, for And the Infernal Contract had lots of humor, solid action, and a plot that held up very well. We also got to see more of what makes these characters tick and how they relate to the world (Eve explains magic in terms of her military training, describing magic artifacts as "weapons of mass destruction" the Librarians have to keep a tight rein over). To misquote my bete noire (who loves hearing from people...unless they disagree with him), more stories like these, Librarians.